Climate change has the potential to have affected ancient civilizations by spurring migrations and changes in cropping strategies, and the¬se questions are increasingly relevant as we look at how modern civilization is coping with climate change today. 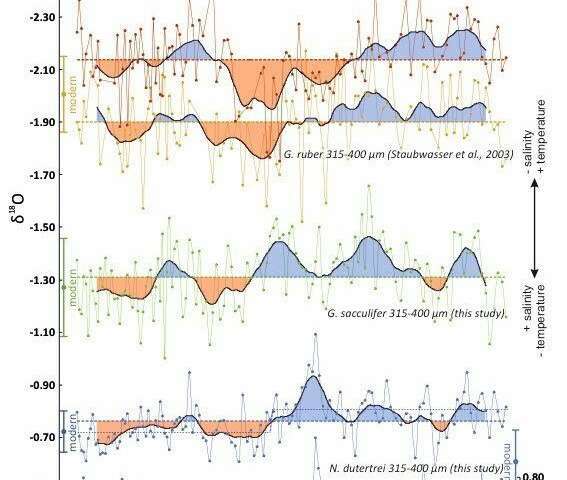 An article published today in a special issue of Climate of the Past on the "4.2 ka BP climatic event" provides rich insights into how rainfall in the northwest of South Asia changed over the critical period between 5400 and 3000 years ago. The marine sediment core known as 63KA was taken close to the mouth of the Indus River delta and holds important and intriguing information about past changes in river discharge and depth of ocean stratification. The discharge of the Indus River is directly linked to the amount of summer rainfall. Ocean mixing depth is related to the strength of winds and evaporation over the Arabian Sea during wintertime that, in turn, correlates with winter precipitation over northwestern India. Three species of planktonic foraminifera with distinct ecological niches have been used to track relevant changes in salinity and temperature by measuring the oxygen isotopes from their calcareous shells, which produce a synchronous record of summer and winter monsoon strength. Work on samples from this marine core attracted wide interest in 2003 when a summer monsoon mega-drought around 4.2 thousand years ago was related to cultural transformations of the Indus Civilization, which had an urban phase spanning from c.4.5-3.9 thousand years ago. Prof. Michael Staubwasser from the University of Cologne, who was lead author of the 2003 paper and is co-author on the latest research, safeguarded samples from this core for over 20 years. "We always thought there might be more valuable information left in these samples," he says, "and we can now see that it is possible to track both summer and winter precipitation from the same core." 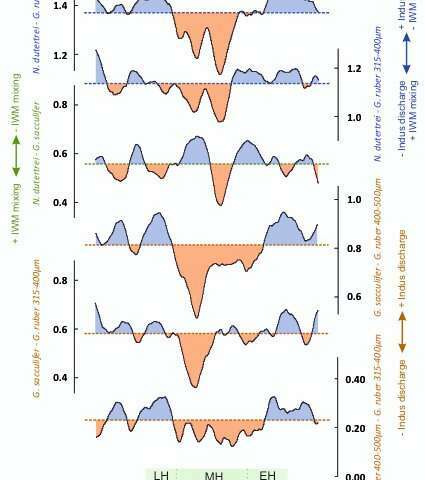 The new results point to a 200-year period of abnormally strong winter precipitation between c.4.5-4.3 thousand years ago, and after this, winter and summer rainfall both decreased to a minimum at c.4.1 thousand years ago. "Humans are completely dependent on constant access to water. The possibility of a simultaneous decrease in winter precipitation by 4.1 thousand years ago completely changes the picture of year-round water availability in this region. A shift from plentiful winter rain to the totally opposite extreme, in combination with summer monsoon rains that were already declining, will have had a dramatic impact upon the people living in this region" says Alena Giesche, lead author on the new publication and Ph.D. candidate in Earth Sciences at the University of Cambridge. Climatic changes during this time period coincide with important cultural changes in the Indus Civilization, which saw the culmination of a process of deurbanisation by c. 3.9 thousand years ago. "This finding has important implications for our understanding of the Indus Civilization, particularly our interpretation of changes in settlement patterns and cropping strategies. There was clear decline in the major urbanized centres, but there was also an increase in the numbers of rural settlements in the summer monsoon-dominated regions in the east, suggesting that populations adapted to changing conditions," says Dr. Cameron Petrie, co-author and Reader in Archaeology at the University of Cambridge. The new results are particularly exciting because they track two rainfall regimes in the same exact core. "This is a unique core, because the sediments are laminated and not disturbed by mixing by organisms (bioturbation). It has a detailed radiocarbon chronology and because proxies for both the summer and winter rainfall are recorded in the same samples, the relative timing of the two can be determined with confidence," says Prof. David Hodell, co-author and Woodwardian Professor of Geology at the University of Cambridge.